At the Disruption of 1843 strong congregations of the Free Church were established in all the parishes of the presbytery of Tain. The Union of the Free Church majority with the United Presbyterian Church in 1900 however saw the disappearance of a separate Free Church witness in at least two parishes including Tain, where the large congregation and its minister entered the new United Free Church, taking the whole property of the congregation with them. A minute dated 23rd November 1906 records a meeting in the Tain Masonic Hall of “those desirous of forming a Free Church Congregation in Tain”, and though the records of the years following are by no means complete, we can trace the origin of the present Tain Free Church to that date. By 1910 a corrugated iron church was built on the current site, with the present building being erected in 1938. The congregation had retained its property in 1900. The story of how the Free Church came to occupy and retain the ancient Parish Church of Edderton after 1843 is quite unique. It had been abandoned as no longer fit for worship about 1840, but after the Disruption the new Free Church simply returned to the empty building and continued to use it until 1990 when the Kirk-Session decided to stop holding the annual Communion season on the fourth Sunday in August. The two congregations of Tain and Edderton were joined by the General Assembly as neither was strong enough in the early days to support a minister alone. It was the money from sale of the Edderton manse that enabled the purchase of a new manse for the joint congregation in Tain. But it was not until 1931 that they were successful in obtaining a minister when Rev R. J. Murray was settled there. Over the years, the Edderton section of the congregation declined in strength and services of the joint congregation were latterly all in Tain with those living in Edderton coming to Tain to worship. •The first minister was the Rev R.J. Murray who began his ministry in the town in 1931. •The Rev Clement Graham became minister in 1943. He was called to be a professor in the Free Church College Edinburgh in 1973. •The third minister was the Rev Kenneth Macleod who came to Tain in 1974. •He was followed by Rev Innes Macrae who ministered from 1983 until his retiral in 1998. •Rev Ronald Morrison was inducted to Tain in 1998 following a year in Sydney NSW having previously ministered in the Free Church in North Uist. The old Fearn Free Church can still be seen on the Fearn to Balmuchy road. The number of those adhering to the Free Church in 1900 was sufficiently large that all the congregational property remained with the Free Church of Scotland. The large building on the Fearn to Balmuchy road was replaced with a smaller and more suitable church in Hilton village in the 1970s. Fearn (Hilton) Free Church on King’s Street, Hilton. •The first minister was Rev George MacKay who came to the congregation in 1910 and retired in 1942. •The Rev Duncan MacLeay was minister from 1943 until 1969 when he accepted a call to Snizort in Skye. •Rev Neil Macdonald was minister from 1970 until his retiral in 1997. •Rev Donald MacIver was minister from 1998 until his retiral in 2008. When the Fearn Congregation became vacant in 2008 on Rev Donald MacIver’s retiral, the Northern Presbytery, after consulting both congregations, decided that Tain and Edderton should be united with Fearn and that the new congregation should be known as Tain and Fearn Free Church. This was agreed by the 2009 General Assembly, and the two congregations became one in August of that year, under the ministry of Rev R. Morrison, minister of Tain and Edderton. After the retiral of Mr Morrison in 2010, the congregation called Rev A MacAulay to be its minister in June 2012; he was ordained and inducted in August 2012, the first minister to be inducted to the new congregation, but successor to the many who have served since 1843. 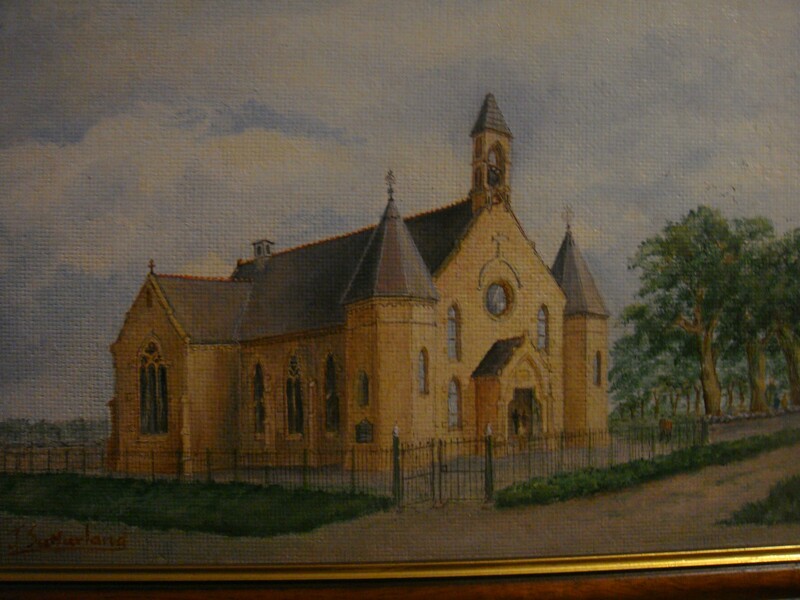 Water colour painting of the old Free Church at Fearn by Johan Sutherland (1916-2014) from Hilton.